The one major decree that will come out of the Congregation will be the result of long conversations, both in small groups and in the aula, under the general theme of “Life and Mission of the Society”. Although the official text will be published by the General Curia only in a few weeks from now, we give you an idea of the summary and of the main themes that are dealt with in this decree. For the record, a committee had been created before the Congregation to bring together a large number of propositions that had been sent by the Provinces, “postulates” that could be gathered under that broad topic of the “Life and Mission of the Society of Jesus today”. All along the weeks, this committee – supported later by other members of the Congregation – continued the work: several drafts have been prepared, presented, discussed in groups and studied in the aula by the delegates. Finally, on November 10, after going through a very large number of amendments, the Decree was voted and accepted by the Congregation. Here are some of the key elements of this decree. The situation. We live in a time or crisis for the world that does not easily identify its spiritual roots and could be said as having lost the sense of God. With the eyes of faith, we, Jesuits, want to participate in a great ministry of reconciliation based on justice, faith and solidarity with the poor, something that was at the core of the experience of our First Companions. Jesuit life. To achieve this, we need discerning local communities who are well rooted but at the same time open to wide horizons. The local Jesuit community, that uses discernment, is the natural place for encounter and sharing. It must be a “home”, where simplicity of life and openness of heart allows the Jesuits to reach out and to share with others. Mission with passion. Then the Jesuits can be “men on fire with the Gospel Passion”. To be real, this must be based on constant spiritual renewal through our tradition, especially the Spiritual Exercices. This will allow the Jesuits to be capable of enflaming those they meet, with a important dimension, that of compassion. And for us, Jesuits, compassion is action, action that is discerned together to insure its genuine quality. With Christ the Reconciler. 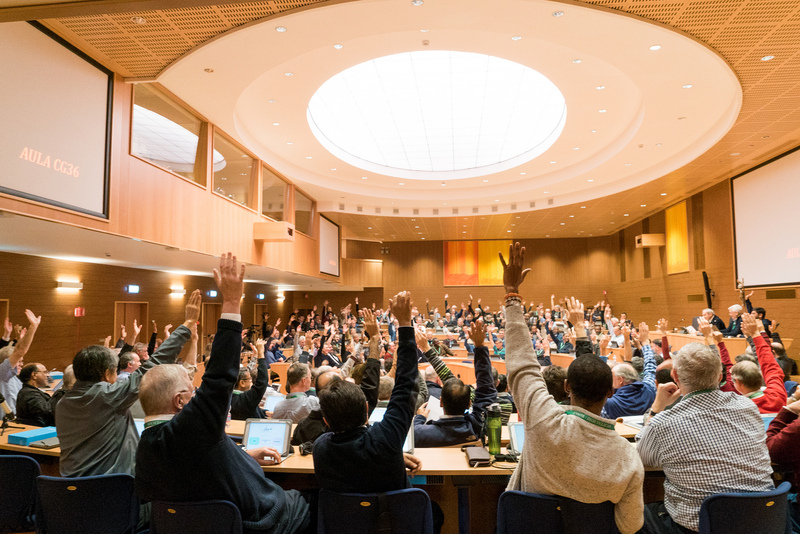 In clear relationship with the invitation of the 35th GC, this GC reminds the Jesuits about the centrality of their role in reconciliation with God, with humanity – especially through their ministry of justice and peace that fights against inequalities – and with the creation, in the line of Laudato Si’. All this should make Jesuits supporters of those who seek the common good and, at the same time then, struggle against fundamentalism, intolerance and all kinds of conflicts. To give life to these objectives, the Congregation is asking Fr. General to develop goals and guidelines for our apostolic life today. Doing this, he will help us to be among the “people of good will who can face the darkness of the world consoled and guided by the fire of Christ’s love”.